Uraguay is a small country that was tossed between Spain and Portugal for years before ending up in Spain’s net. Until the end of colonialism when the newly independent entities of Argentina and Brazil decided to leave Uraguay as a tiny buffer between their two mammoth countries. You can drive from one side to another in a single day and during the summer, there are probably more Argentinians on their beaches than natives. One half of the whole population lives in Montevideo which, even so, is a pretty small town. Lovely markets though and beautiful old colonial houses. If you take a boat, it only take three hours to get from Buenos Aires to Montevideo and a very nice boat it is too. In fact, it is one of the nicest conveyances we have been in by far. Big windows, comfy seats, a snack bar, clean banos; the perfect place for the kids to catch up on their grammar workbooks! We love having the kids do homework while enroute from one place to another because they can’t escape. 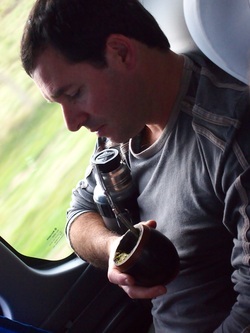 Once we disembarked in Uruguay we learned two major things - they are crazy mad about meat and mate. 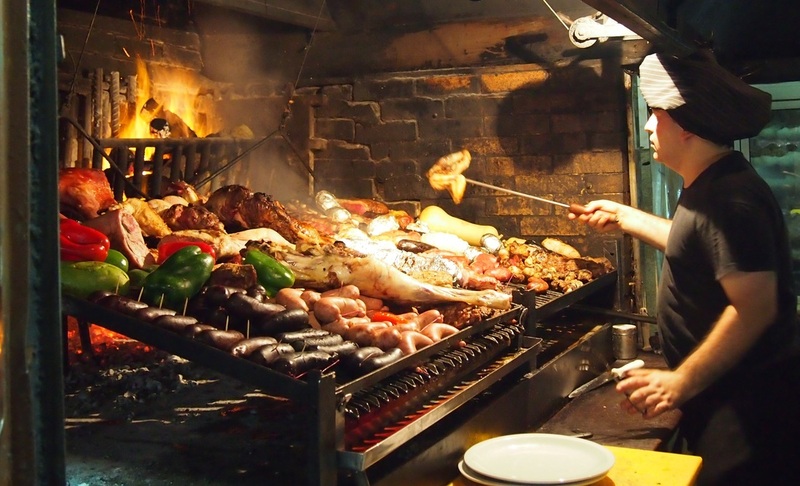 I did not think it was possible to find a people that ate more meat than in Argentina, land of steaks galore. But Montvideo puts Buenos Aires to shame. The first night we ate at a small, simple restaurant that offered 20 different sections of cow including entrails. The next day we went to Mercado del Puerto where we found at least a quarter of the population crammed in among mammoth fires blazing away, grilling steak, ribs, sausage and the occasional red pepper thrown in for color. After three days I was ready to become vegetarian. I craved soup and salad. 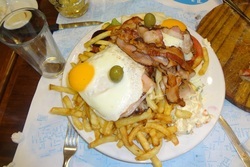 The final blow was when in a fit of “cultural diversity” we ordered the traditional Uruguayan dish - the chivita. Otherwise known as a heart attack on a plate, it is a fried egg and bacon on top of cheese on top of ham on top of steak on top of french fries. Yeeech! The second major thing the Uruguayans completely surpass Argentinians in is Mate. This is a kind of herbal tea, more caffeinated than the regular tea, less caffeinated than coffee. 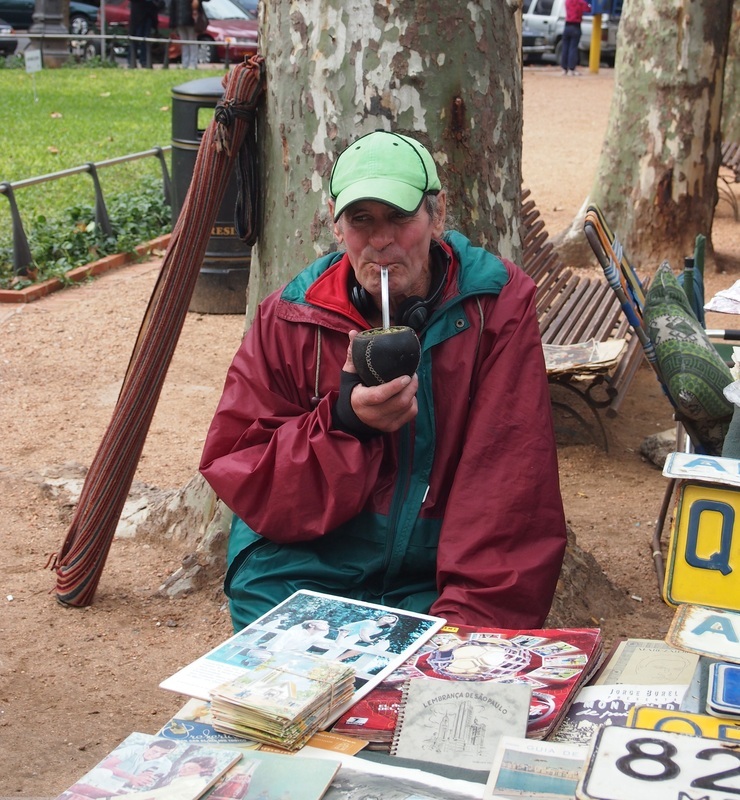 We had seen people drinking mate in Argentina. Indeed, at every market and craft fair in Buenos Aires you find the special cups needed to drink this tea, which are made out of gourds usually elaborately decorated with silver. And you find the special bombilla they is used to sip the tea - a silver straw with a sieve at the end to filter out the bits of leaf and twigs that make up mate. This is a traditional drink the Argentinian are very found of, one of the very few things that the colonialists actually learned from the indigenous Indians. how they don’t lose their fancy cups all over the place? Don't they ever put them down to buy a newspaper or something? how they can get through the day using only one hand since the other one is constantly occupied by holding a mate cup? They actually had to pass a law in Uruguay prohibiting people from drinking Mate while driving since too many people were having accidents when they accidentally scalded themselves while refilling their gourds. Truth. Everybody, everybody drinks mate, everywhere and any time. Even the street cleaners stop to take a mate break. We learned that it is a very social ritual. One person is the "Mate Master". They mix the tea and determine the proportions but they also have to drink the first round which is usually vile. Then they pour fresh hot water over the leaves and pass it to the next person. As the tea leaves seep over and over again with each replenishing of hot water the drink gets mellower and tastier. Every receptionist, every cashier and every office worker has her thermos and cup at the ready. Mind you, this means each person not only has to carry around their full cup of boiling hot mate but all keep close by an entire thermos filled with more hot water to keep topping up his or her drink. 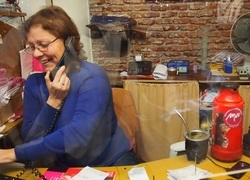 Needless to say, the variety and sophistication of thermoses in Uruguay beats all other countries by good mile. How is this guy able to fall asleep on the bus without dropping his full cup of Mate!? He is even keeping his thermos safely tucked under his arm. 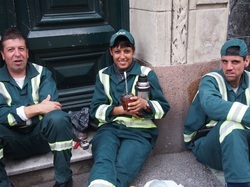 Of course when we got back to our apartment in Buenos Aires we all wanted to try mate to see what the big deal was. Lucas, our math tutor demonstrated the particular, special way of brewing the tea and we all tried some. After a hefty addition of sugar both Miriam and Leontine pronounced it “Muy Bueno”. After doing a bit of research on the history and chemistry of the mate plant, we discovered that mate not only has higher levels of anti oxidants than green tea but that it significantly lowers your cholesterol. No wonder the Uruguayans drink it non stop, day in and day out! It is the only thing standing between them and certain heart attack!